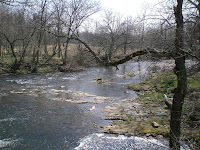 The 23rd Annual Stony Creek Clean-Up is scheduled for Saturday, March 28, 2009 - 8AM to Noon. Volunteers are asked to meet at the Fire Chief’s Memorial Band Shell in Elmwood Park, Norristown, PA .
Last year's clean up had the largest turnout ever as 172 volunteers filled a 20 yard dumpster to the brim! Some large items removed included a piano, 2 sofas, 4 bikes, 1 wagon, 40 tires and a sizable pile of scrap metal! The Stony Creek Anglers will supply gloves & bags. The Norristown Maenner-Chor Club will provide lunch. Starbucks will supply coffee & donuts. The Borough of Norristown will supply a dump truck & driver. Louis Mascaro & Sons will supply dumpsters. The King of Prussia Home Depot will supply other materials. We always need vans & pick ups to get the volunteers to different sections of the Creek. It is a Rain or Shine Event! Please dress according to the weather and bring boots & waders. This year's clean up will be in memory of Forrest (Woody) Miller and Janice Kizina.